When it comes to conversations, there are three distinct sentiments that we feel. There are the conversations we love to have such as when we’re ordering a delicious pizza for that big game, and conversations we hate to have like when we’re calling for tech support. Our sentiment towards conversations shapes our expectations and tolerances and thus should impact chatbot personality. You’re going to be much more receptive to humor when ordering a pizza versus addressing a fraudulent credit card charge. You need to identify what conversation type your chatbot is dealing with and shape the user experience (UX) to fit the sentiments of the user best through your chatbot personality. In the infographic below as the user’s sentiment towards the conversation improves you have more flexibility with the chatbot personality. If your chatbot is addressing conversations that users hate to have then you need to give careful consideration to its personality and tone of voice when designing the chatbot personality. Users dealing with these conversations are going to have short fuses and less tolerance for unnecessary jokes. Examples of these types of conversations could include tech support, fraudulent bank charges, or even paying bills. In these cases, it is probably better to err on the side of caution and stick to a chatbot personality on the subtle end of the spectrum that is more direct and professional in tone. The last thing you want is to prolong an already undesirable conversation by inserting humor the user doesn’t want in the first place. Getting the user to the resolution they’re seeking, as quickly as possible, should be the primary goal of chatbots built to handle these hated conversations. 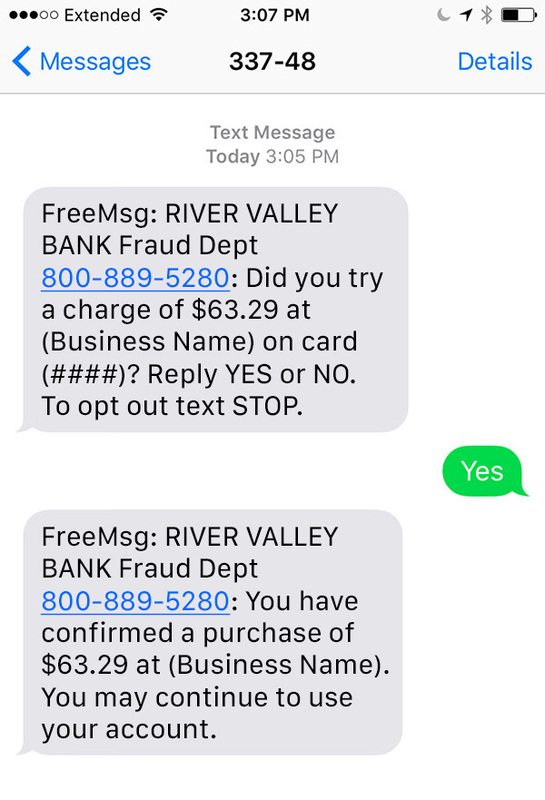 In the screenshot example below you can see why a chatbot tasked with handling conversations related to fraudulent bank charges should not be laden with humor and an unprofessional tone. Tread carefully when it comes to designing the chatbot personality for these conversations. When your chatbot is fortunate enough to handle conversations that users enjoy, you should be drooling at the mouth for the opportunity to craft a well-thought-out chatbot personality. Users engaging in these conversations are going to be far more receptive to a unique chatbot personality and some witty banter from the chatbots. In fact, failing to capitalize on this opportunity to craft a strong chatbot personality could be the reason you lose out to the competition. While you have a lot more leeway when it comes to your chatbot’s UX and the overall chatbot personality with these lovable conversations, you should also be wary about venturing too far into left field. For example, if your chatbot is supposed to recommend wine and dinner pairings, then you may not want to give it the chatbot personality of a mad scientist. Instead, have the chatbot act like an actual wine sommelier would at a vineyard. Personable, knowledgeable, and with a little bit of wine-appropriate humor mixed in would make for an appropriate chatbot personality in this instance. Your users will be more apt to take your chatbot’s recommendations seriously if it emulates the typical real-life experience they’re accustomed to. 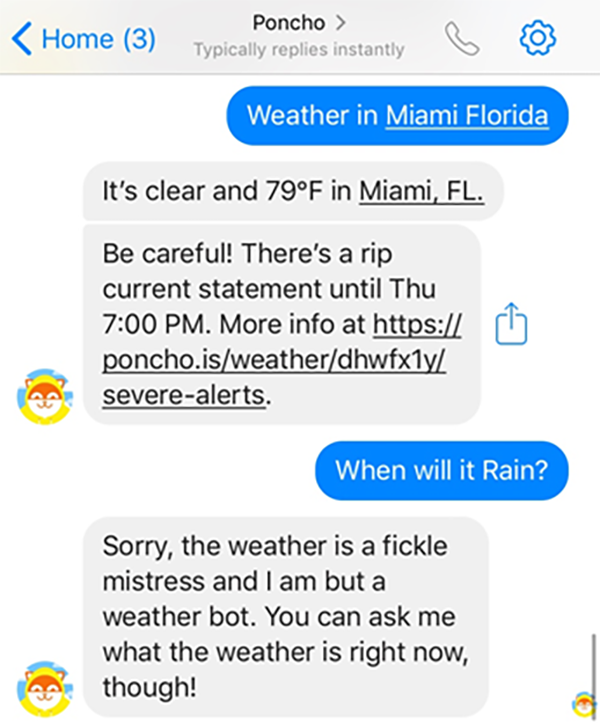 In the screenshot below you can see a perfect example of why users will be far more receptive to a unique chatbot personality when dealing with a more enjoyable conversation such as inquiring about the weather. This is arguably the most significant challenge when determining how to mold the chatbot personality and tone of voice. Unfortunately, it’s going to be far more apparent when dealing with a conversation that is on one of the far ends of the love/hate spectrum. 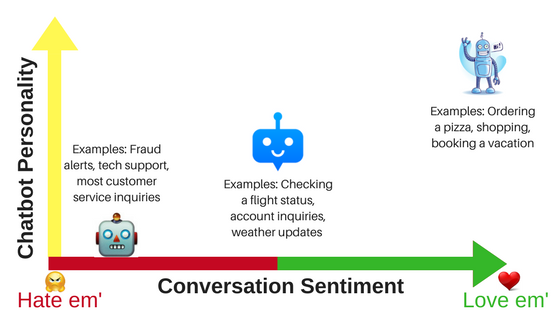 Examples of conversations in the middle of this spectrum include basic account inquiries, checking flight statuses, gathering sales information, or even finding out how and when to contact a business. In these conversation scenarios, you should still err on the side of caution when in doubt regarding the chatbot personality. Because users aren’t exactly thrilled to have these types of conversations they may still be prone to impatience and have a low tolerance for inappropriate humor. Ultimately, users are looking to get some sort of value from your chatbot, and you should aim to provide it as simply and quickly as possible without letting the chatbot personality get in the way. To some users looking to book travel arrangements, the Hipmunk chatbot shown below may go a bit overboard at times with its chatbot personality and jokes. If you can find opportunities to mix in some fun and joking around in the chatbot personality without disrupting your value proposition and natural conversation flow then, by all means, go for it and take advantage. Your chatbot may even cause a user to learn to love one of these conversations if you’re lucky. That’s nearly a best case scenario when it comes to crafting a chatbot personality. If you aren’t currently using chatbots towards the goal of being able to provide better service and support, then you’re running the risk of falling well behind the competition. Start doing your research and find out whether or not a chatbot aligns with the focus of you or your organization. For tips on determining the best chatbot platform for your needs check out one of our previous posts on the subject. We would love to give you a demo to show you just how powerful our native chatbots are when combined with the Relay intelligent support platform. Schedule a demo, and we’ll help you transform your support and service operations and take your organization to new heights. Want to read more about how AI and chatbots will impact the future of customer service and support? Sign up for our monthly newsletter that shares our best content for free and follow our publication on Medium! © 2019 Relay. All Rights Reserved.